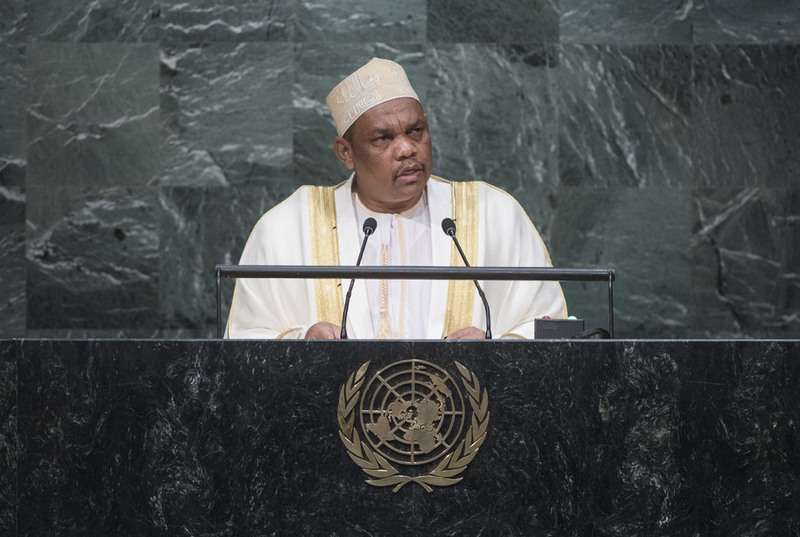 IKILILOU DHOININE, President of the Comoros, said that he was speaking for the last time after five years in office and wished to convey a message of solidarity from his people and his Government. Today, as in yesteryear, nothing prevented the international community from combatting pollution and poverty, and so the world must act. The leaders of the world had a responsibility in the face of an impending disaster, and must work rationally to save humanity. Leaders must take advantage of the unprecedented framework to make the planet sustainable and equitable before 2030. His country endorsed the new 2030 Agenda that built on the achievements of the Millennium Development Goals and opened up new goals for the next 15 years. It was the duty of the international community to work towards equality for all, including women’s empowerment. One could not imagine that man would thrive on this Earth unless urgent action was taken to combat climate change, he said. Forests must be managed sustainably and ocean ecosystems must be preserved. It was also necessary to put an end to biodiversity loss. The goal was to build a new and sustainable world through a new road map. The survival of the world depended on such bold goals. For decades, Africa had been beset with colonialism, he said. Now, the world felt the consequences of wars that forced many men, women and children to leave their homes, board makeshift boats, and live in inhumane conditions or remain vagrants. The barbarous acts perpetrated by terrorist movements needed to be combatted by the international community through the use of one voice to say “never again”. In a world of complete deprivation, how could a small country be engaged in such a fight? he asked. Against the will of the Comoros people, France had used its veto and continued to exert power over the territory. This was not acceptable, and he demanded that international law be applied. He asked the community of nations to ensure the application of international law so that a lasting solution to that dispute could be achieved. He welcomed the fact that the State of Palestine had finally been able to raise its flag at the United Nations, and that the United States and Cuba had renewed relations. It was heartening that States could overcome deadlocks and foresee a peaceful future for their peoples. He also welcomed the new Iran deal, which boded well for international cooperation. As his country stood ready after 40 years of independence to begin the second phase in its history, he remained confident that the next president of the Comoros, speaking from the rostrum of free countries, would be able to say that his country had achieved its own territorial integrity. He was also confident that his successor would be able to thank the United Nations for acting on the Charter on behalf of the Comoros. The time had come for all to work together to build a free, open and prosperous country that was confident both in its future and in its people’s destiny.